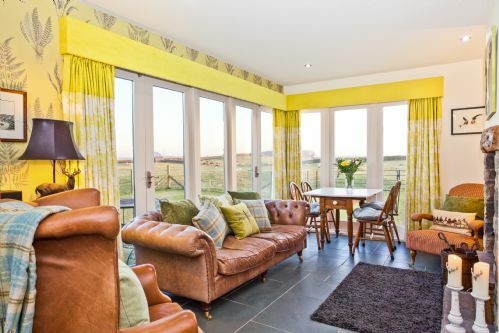 Cross Cottage is a luxurious 5 Star Gold holiday cottage in North Yorkshire. It sleeps 4 guests, in a double bedroom and a twin / superking bedroom. The accommodation is all on ground level. Nice cottage in a very peaceful location. Wonderful views. Perhaps a bit too small for four people though. And could benefit from having more cutlery and crockery. Otherwise, ten out of ten. Splendid cottage with great facilities and with a brilliant view. We loved everything about Cross Cottage. Stayed for a weekend at the cross cottage,really enjoyed our time. A warm and frienly welcome. Cottage very clean, you can find verything what you need for a comfortable stay!!! We stayed here over Christmas and had a very relaxing break. The cottage was very clean and the kitchen had all we needed to cook Christmas dinner! The central heating wasn’t working correctly when we arrived but a quick call that evening and it was fixed that night (albeit it failed to come on at the time it was advertised for the rest of the week) and the television was not working for the best part of 2 days but again a repair man came out late Christmas Eve to fix it and the other cottage that was affected.... which was impressive. I would book again. We were made to feel at home as soon as we arrived by Louise and Steve. The cottage is immaculately clean,the couple that came with us for a few days said it was the best cottage they had ever stayed in! You can tell the owners love their cottage and are proud to keep it in top quality condition. Louise is a wonderful host and if it were possible to give more than excellent on customer service, I would happily do so. The cottage is at a very high standard, tastefully furnished, views are perfect - green fields and sheep behind big windows, combining openness with privacy. The only thing you need to be prepared for if you are a party of four - the kitchen is fairly small (and so is the fridge; good size freezer though). The table in the lounge is too small for eating, so you'll have to clear up the kitchen table and squeeze in the kitchen. But that's all doable and it's a cosy environment. Definitely a place to come back to. Actually, I wonder why should I leave already at all? Warm and friendly greeting! Beautiful and comfortable accommodation with added and thoughtful touches! Stunning views and we even got a weekend of glorious sunshine! A repeat visit is a must! All needs were catered for as the cottage comes with everything you could want in a holiday cottage. A very comfortable cottage in peaceful surroundings with an excellent view. The owners have taken great care to make a wonderful holiday home. The house is beautiful and has every comfort you could need. Wigglesworth is a great base for exploring North Yorkshire with too many things to do locally. Our five year old loved helping with the animals and collecting the eggs from the chickens. They do taste better as well! We loved staying in Cross Cottage. We are glad it wasn't all excellent as we may have been frightened to move! Especially having our boxer dog with us. We all loved the views, the peace and quiet and having an excellent base to explore North Yorkshire and Lancashire. Why have we not been to this area before? As we live quite close we had a preview before booking. We thought it was wonderful then and we have not been disappointed. Everything has been first class from start to finish. Comfortable,clean with superb views both front and rear. Even when we strayed into Lancashire the natives were very friendly. Louise is lovely and a wonderful host. I would hope to come again. Thank you for putting up with my Oxygen needs. We have enjoyed our stay at Cross Cottage and would recommend It wholeheartedly. Excellent cottage in beautiful location. Well equipped with everything you would need even for the dog with towels and treats. White Company toiletries were a lovely touch. We had a wonderful stay Thanks Louise we will return. The Cottage was in a stunning location, with excellent walking for our dog. It was extremely comfortable with 5* furnishings, with everything needed being provided.Good welcome pack provided. Even the dog had her own Welcome pack! Taps on ensuite sink were awkward, they seemed to be turn on and off the wrong way round, which took some getting used to. Lovely cottage, beautifully decorated, with fabulous views across field and moor perfect for dark skies star gazing. Thoroughly equipped with everything you could need including tea, milk, butter and fresh bread in the kitchen and White Company toiletries in the bathrooms. Even the dog was provided for with a special bucket full of towels for muddy paws and a packet of dog treats. We had a wonderful stay. Thank you Louise. We stayed at Cross Cottage for New Year and could not have chosen a better venue. We arrived to a spotless, cosy, characterful cottage surrounded by panoramic scenery. We were welcomed by the owner herself. Every attention had been paid to detail to ensure that we felt at home immediately and were comfortable. A real fire and Christmas decorations and a tree ensured our stay was enjoyed in a special, festive setting. The cottage is also ideally located for exploring both towns and countryside. Settle was literally 10 minutes by car which was ideal when self catering. We will return. Thankyou Louise and Stephen! Christmas tree and trimmings greeted us in this cosy cottage. Everything we needed and lovely views. A cosy cottage with wonderful views. We loved our stay in this cottage, with its beautiful views of the three peaks. Everything was spotlessly clean and the kitchen was very well equipped. The location is peaceful and yet not too far from all the Yorkshire Dales has to offer. We have previously stayed in Gamekeepers and have found Cross Cottage just as lovely. Cross cottage has everything you need for a comfortable tranquil stay. The kitchen is well equipped. Plenty of towels. Games books and dvds in case you get tired of drinking in the beautiful views from the house. The owner was extremely friendly and helpful and also welcomed us with milk butter bread cheese wine and freshly laid home produced eggs ! The house is very clean and beds very comfortable. Have stayed twice already and will definitely be back. Lovely setting, welcoming & helpful hosts, and a charming property with some thoughtful personal touches. Beautiful cottage very much home from home , everything you need for a relaxing stay . The views are stunning and it's a delight to watch the wildlife in the garden . The cottage contains everything you need and is very luxurious , beds very comfortable and the decor is lovely . Louise perfect host we were made to feel most welcome . We had a great time at Cross Cottage. The owner was very helpful when our car broke down en route. She even offered to pick us up - together with all our luggage and bikes - from the nearest garage. The cottage was extremely well equipped and we liked that both bedrooms were en suite. We have stayed at Cross Cottage twice already and will continue to visit for many years to come. We love its location, with close access to the Yorkshire Dales, numerous walks, cycling routes and sights, and boasting its own beautiful views which are a perfect setting for relaxing family evening meals and watching the sunset. On our most recent visit we climbed Whernside, cycled Malham Tarn and took a trip to Appleby on the Settle to Carlisle Railway. We love the cottage, it is warm, comfortable and very thoughtfully equipped and works well for our family of 3. We had a really excellent stay, very comfortable, all our needs were catrered for. Exactly as described on the website. Surrounded by sheep, geese & chickens, with uninterrupted views across the top of the Dales. Louise, the owner, was very kind & thoughtful, especially when my wife was unwell. Many thanks. We had a wonderful stay at Cross Cottage last week. The cottage is comfortably furnished with stylish touches yet was family friendly too. Louise provided us with some extras for our toddler such as a non-slip bath mat, step, plastic plates and cutlery and a box of toys that was very popular with both the toddler and her big sister. The beds were super comfortable and we slept very well. The bathrooms were luxurious and lovely White Company products were provided. The kitchen was well stocked for cooking and fresh eggs, butter, milk, cheese and bread were provided along with a few pantry items (tea / coffee / sugar / oils) and washing / cleaning products. We loved getting home from a trip out to light the fire and read / play games then cook dinner. There was a huge selection of books to read and DVDs to watch. Our kids were thrilled to have a TV in their room and watch a DVD before bedtime (a holiday treat!). The girls also enjoyed helping Louise to collect eggs and loved eating the fresh eggs for breakfast whilst watching the sheep in the next door field. A lovely, relaxing break for us all. We would absolutely recommend and hope to return some day. What a fantastic little cottage! Great base to explore the Yorkshire Dales. The cottage is luxuriously equipped and has everything you could think to need! Loved coming back to a cozy fire after walking up Malham Cove and Ingleborough. Hosts were fantastic and whilst not intrusive, very friendly and helpful! Will definitely be coming back to this cozy wee cottage!